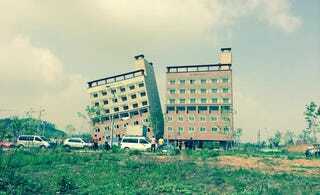 A new apartment complex recently went up in Asan, South Korea. It went up, and then, it started to lean. According to Korean paper The Chosun Ilbo and Wiki Tree, the building was slated for completion by end of this month. However, it suddenly started leaning to one side. It's believed that either a faulty foundation or a subsidence caused the tilt. Thankfully, no one was injured when the building suddenly shifted. The unsafe apartment building, which the South Korean media is comparing to the Leaning Tower of Pisa, will be demolished from the site, but not from our memories.